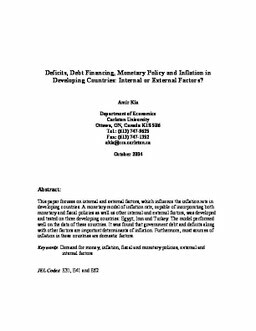 MacOdrum Library - Carleton's Institutional Repository: Deficits, Debt Financing, Monetary Policy, and Inflation in Developing Countries: Internal or External Factors? Deficits, Debt Financing, Monetary Policy, and Inflation in Developing Countries: Internal or External Factors? This paper focuses on internal and external factors, which influence the inflation rate in developing countries. A monetary model of inflation rate, capable of incorporating both monetary and fiscal policies as well as other internal and external factors, was developed and tested on three developing countries: Egypt, Iran and Turkey. The model performed well on the data of these countries. It was found that government debt and deficits along with other factors are important determinants of inflation. Furthermore, most sources of inflation in these countries are domestic factors. Kia, Amir. (2004). Deficits, Debt Financing, Monetary Policy, and Inflation in Developing Countries: Internal or External Factors? (No. CEP 04-15). Carleton Economic Papers (CEP). Department of Economics.